Let me put a question, for which I have quoted this verse in two different translations, the King James Version and the New International Version. This verse refers to humor. Does it refer only to off-color humor, or humor as a whole? The ambiguity is there in the Greek, which can mean witty repartee, humor as a whole, or vulgar humor specifically. The immediate context suggests coarse speech, but I would be wary of simply concluding that the verse only deals with lewd humor alone. ThePhilokalia gives encyclopaedic lists of vices, and some of them list jokes; in context coarse jokes are condemned but the condemnation is not limited to lewd humor. One thing we might miss if we simply try to resolve an ambiguity and ask, “Does the verse refer to off-color humor alone, or humor as a whole?” is that the quintessential joke, the bread and butter of rec.humor.funny, the joke that has its own Wikipedia entry, is the obscene one: the joke that is good enough for polite company is just hanging along for the ride. But let us leave that for the time being. And let us give the benefit of the doubt to the interpretation of one word in one verse: even if I am raising a concern about humor as such, including good, clean humor, one word in one verse is not the best place to argue from. Besides the Philokalia can include jokes and laughter when an author tries to catalogue every vice, I am concerned about Mark Twain’s “The secret source of humor is not joy but sorrow; there is no humor in Heaven.” I am concerned because my best sense is that he was right. The secret source of this joke’s humor is pain. It smuggles in more pain than you would imagine at first: someone is idiot enough to try to go ice fishing in a hockey arena. And the humor comes when that pain is pulled into the open. Nor, really, is the pain just for the people in the joke. The joke is a pleasure laced with pain. Perhaps there is a pleasure-pain syndrome where pleasure is laced with pain, but here we do not notice we have been sickened. I once thought this joke would have been a good basis for a homily, to paint a picture where people ask of someone who dares to speak decisively in morals, “Who do you think you are? God?” and we reply that we’re just arena employees. But to a friend I was talking to, and to me, there was something that seemed wrong about using this joke in a homily even when it might serve as an excellent springboard. Not all jokes are created equal: the crass vulgarity is more wrong than the clean joke and the sidesplitting joke you repeat is more wrong than the spontaneous banter, but there is a line of continuity between all of these, between the cleanest and the most foul. So is there good news? I would place two mental images in opposition to each other, in response to the question, “Is there any good news?” One is a place I worked where there was constant lewd joking; overall I got the impression that the obscene banter was a desparate bid to say something interesting, from people who could have had any number of interesting discussions. The chief effect I remember experiencing was not exactly being offended, but drained and drained. If an off-color jab is a desparate bid to say something interesting, it is not exciting, but dreary: if the most interesting thing you have to say are the same five dirty jokes, how great is that dullness! The other image I would place opposite it is a priest standing, eyes closed, silent, intently concentrated in prayer. He is joyful, but the overall striking image is less joy than silence that speaks volumes. And this priest does not tell jokes, at least not often. But humor is not something missing from this priest. Maybe he does have a sense of humor and a few favorite jokes; I don’t know. But what he has is better than funny, and what he gives others is better than a joke, however funny. He has and shares joy, and the rapt silence which is among his greatest treasures is also something he shares to the best of his ability. When I was moving towards Orthodoxy, an Orthodox friend warned me that he had found Orthodoxy to be “a long road of pain and loss”. This he said, not to deter me from Orthodoxy, but so I could “know what you are getting into.” And his words have proven true, but there is something he didn’t tell me. The very real road of pain and loss has cost things I’d never imagine I’d be giving up, but the pain and loss have been the pain and loss of dislodging pieces of Hell and making room for a fuller grasp of Heaven. 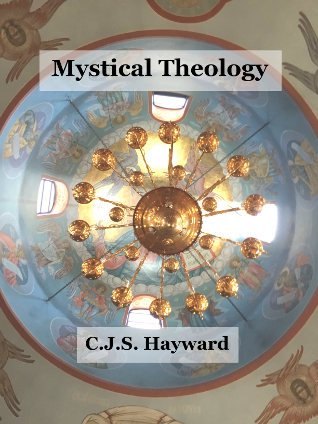 Orthodoxy has cost me my interest in fantasy, which is the same as saying that it cost me desires for things that were not real and I could not ever have, and given me in place desires for things that were real and a fuller desire for the One who is supremely Real. Orthodoxy has cost me my almost religious “faith” in science, which is ultimately to say that it has cost me answering some of the wrong questions. Orthodoxy has cost me trying to sate myself on pleasures, and cleared a distraction from things that offer genuine satisfaction. If Orthodoxy costs me an interest in humor, it may be so that I can live here on earth the Heaven that has never known humor’s sorrow. If Orthodoxy bids me say farewell to my search for earthly honors (I really have enough), it is so that I may search for Heavenly honors: the only honors that really matter. In all these things God is at work to give me the maximum in life. The details and particular journey will be different for different people; this post and The Pleasure-Pain Syndrome pull from the Philokalia, but pull mint, dill, and cumin where the Philokalia offer justice, mercy, and faith. The Philokalia offer detailed discussions about how we are lured into different demonic traps, but the discussion of jokes is trivial by comparison with the discussion of unchastity. If it is even trivial. It does not occupy center stage, ever, but there is something worth unfolding, and it is particularly worth unfolding here and now. We live in a time of pleasure seeking where pleasure delivery systems like Viagra sell. We also live in a time of lesser pleasures: pleasure delivery systems like televisions and smartphones sell. And we do not say with St. Paul, “When I became a man, I put childish pleasure-seeking behind me.” And in this context, it can stretch us to say, “Jokes are nice, but I’m trying to avoid them and move on to bigger things.” One could more sharply cite the Desert Fathers, “The Last Judgment awaits, and you laugh?”, but we can say, “Sorry; it’s powered by hidden pain; I’m looking for my happiness from other sources.” And we can make a small step to move on to bigger things. Could you cut back on jokes, just a little? Previous Previous post: How Shall We Live This Instant?